Old-growth forest in Oak Bluffs is planned site for town solar array. A plan by the Oak Bluffs water district to build a large solar array off Barnes Road has been significantly downsized but continues to draw heat from Island ecologists who say removing ancient woodlands would defeat the purpose of developing more renewable energy. A public hearing on the project that began in February reopens before the Martha’s Vineyard Commission Thursday night. The revised plan calls for clearing 10.37 acres abutting the Manuel F. Correllus State Forest — about half the size proposed in January — and installing about 1.5 megawatts of solar capacity, compared to the approximately three megawatts first proposed. If approved, the project will be the first municipal solar array in Oak Bluffs. The five other Island towns all have built arrays in recent years, generating power to reduce town electricity costs. 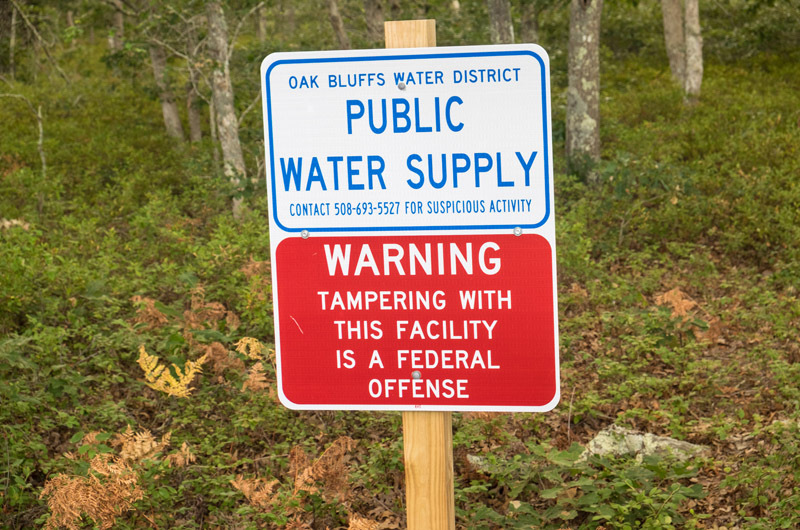 The Oak Bluffs water district, which operates as its own governmental entity and owns the land, aims to do the same. The site abuts the Margaret K. Littlefield Greenlands, bought by West Tisbury in the 1980s to protect the aquifer. Three public wells lie on the property, which has been designated a sole source aquifer area by the Environmental Protection Agency and listed as a rare species habitat area by the Massachusetts Natural Heritage and Endangered Species program. The EPA has given conditional approval and the NHESP has given a preliminary signoff on the plan. But the project has been controversial for the fact that it would involve clearing a large area of old-growth forest. 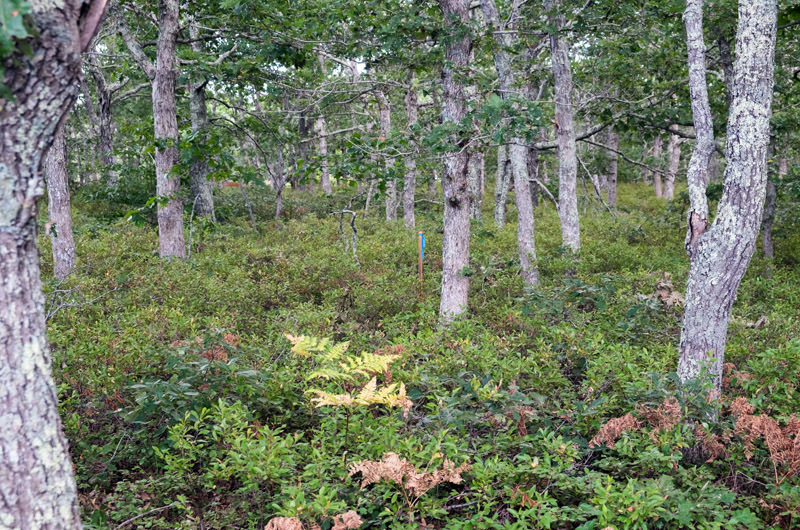 The Island’s ancient woodlands have declined since the 1800s, although second-growth forest has led to a net gain of woodland cover. Most of the old forestlands, which have never been cleared, extend outward from the 5,000-acre state forest in the center of the Island. In another letter, Polly Hill Arboretum executive director Tim Boland echoed Mr. Foster’s concerns, writing that the project area “represents a greater opportunity to mitigate climate change through ancient forest preservation.” He weighed the benefits of carbon sequestration, water filtration and plant biodiversity against the benefits of solar power, and warned against habitat fragmentation. The commission is reviewing the project as a development of regional impact (DRI). A solar energy bylaw adopted last year in Oak Bluffs provides another level of review, including the consideration of open space, visibility and land clearing. But unlike the MVC, the town does not have the authority to deny a solar project outright. As part of the DRI process, the commission must determine whether the development would have a favorable or adverse impact on the environment in light of the alternatives. Mr. Foster pointed out that the neighboring Goodale Construction Company in Oak Bluffs already has a large solar array, and that as of two years ago, owner Peter Goodale had expressed an interest in expanding it. The MVC meeting begins at 7 p.m. Thursday in the Olde Stone Building in Oak Bluffs. Instead of clearing pristine land for solar, why not take advantage of lining municipal buildings with panels. Or even making residential solar more affordable. With all these optimal roof lines on island, seems like a good opportunity. Why can't they put the panels on roofs? Our Market has a great roof for solar. So do all of the airport buildings, and many others. Cutting down trees to install a solar array is just ignorant. Clear-cutting forest to put up solar panels is a terrible idea that illustrates how truly detached we are from nature. Trees are nature's carbon sequesterers. This is a habitat and an eco-system where many species live. This solar development is motivated by SRECS - money to be made from tax incentives, and not by a true concern and understanding of the environment. As far as solar arrays offsetting municipal expenses - this seems to be a marketing tactic used to sway voters into imagining that there is some kind of financial windfall that will be the result of this development. It is not clear to me that this projected windfall actually ever bears out. In Aquinnah, it is my understanding that we do not see any money from the municipal solar array Vineyard Power erected at our dump. My understanding is that there is some money that goes into an escrow account and that after a certain period of time (after the life expectancy of the panels) we can use this money towards purchasing the then out dated panels from the original developer. A solution to problem, the NEW Oak Bluffs Fire station, plenty of roof space. Problem solved. Or better yet the Oak Bluffs recycling center and waste water area with empty hills just looking for something to do. While we are discussing the Water Plant - how about cancelling our rate increase which is funding restoration of a historic building which processes well water. No ratepayers "voted" for this increase. Simply put, we should not be subject to this "unapproved" expense which had NO impact on our water or our environment. I fully support "approved" expenses towards renovating historic building which are significant. I don't see the water plant, hidden in the woods, as qualifying for our unapproved funding.